The Sulov rocks are one of the most popular sport climbing areas in Slovakia. The rocks are made of conglomerate, climbing routes are 15-40m long and rated as 4 – 10 UIAA. (See grading conversion table if needed). Most routes are rated around grade 7, there are about 15 routes rated as 9+ and higher. 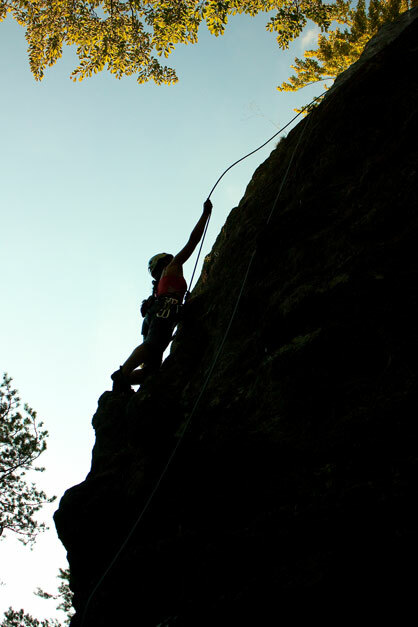 Many climbing routes are also located in the Manin and Kostolec Gorge area (Manínska tiesňava a Kostolecká tiesňava) mostly rated as 6-8 UIAA. The material is limestone. A new rapidly developing climbing area is Paština Závada, located in the neighouring valley northwest of Sulov Mountains. To get to this location, take the road No.61 and turn to the village Hričovské Podhradie. The conglomerate rocks are very similar to Sulov, but you'll see here considerably less climbers. Great place to go (not only) if Sulov rocks are crowded. Every year on the first weekend of June the annual rock climber gathering takes place in Sulov. Expect a great party including climbing video projection, live music and dancing. Climbing restrictions in Sulov Mountains valid until 2015 (so far only in Slovak). Please adhere to them and do not provoke the nature conservationists, otherwise they might forbid climbing in Sulov for all of us. The climbing routes in Sulov Mountains are described and sketched in the book “D.Pauer: Slovenské skaly II.” You can purchase the book directly in the pub Na Kopečku (climbers friendly pub) for cca 12 EUR. The climbing guide for Manin and Kostolec Gorge is the book “D.Pauer: Slovenské skaly I.”. The climbing guide for Paština Závada can be downloaded directly from the webpage of HK Direkt Bytča. Several new climbing routes have been created since the first release of the guide, these should be covered in the next version. More information for climbers can be obtained also on the web www.cappo.sk. It's forbidden to place fire and sleep underneath the rocks (it's a National Nature Reserve).